Consciousness is an arousal and awareness of environment and self, achieved through action of the ascending reticular activating system (ARAS) on the brain stem and cerebral cortex [link]. ARAS is composed of several neuronal circuits connecting the brainstem to the cortex. 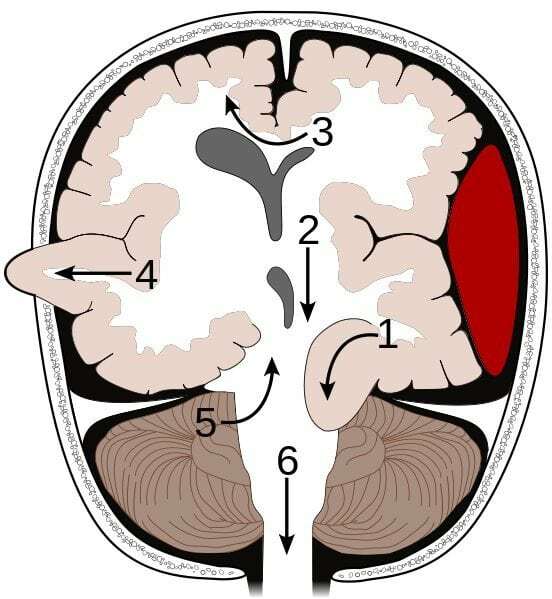 ARAS is composed of structures such as the brainstem nuclei (locus coeruleus, dorsal raphe, median raphe, pedunculopontine nucleus, parabrachial nucleus), and non-specific thalamic nuclei, hypothalamus, and the basal forebrain. These structures may come under pressure with subsequent vascular compromise as ICP rises or when bilateral structures are involved such as with bilateral thalamic infarction. Pontine damage however may show small pinpoint pupils. Foramen magnum Due to a posterior fossa SOL or from further progression of a supratentorial mass lesion or oedema. Compression of cerebellar tonsils and medulla. In the medulla are located the vital centers regulating respiration and cardiac function, and the reticular activating system for maintaining consciousness. In foramen magnum herniation, the following develop: changes in the level of consciousness, extensor posturing, apnoea, and then circulatory collapse followed by death. Foramen magnum Due to a posterior fossa SOL or from further progression of a supratentorial mass lesion or oedema. Compression of cerebellar tonsils and medulla. In the medulla are located the vital centers regulating respiration and cardiac function, and the reticular activating system for maintaining consciousness. In foramen magnum herniation, the following develop: changes in the level of consciousness, extensor posturing, apnea, and then circulatory collapse followed by death.